Sales & Operations Planning (S&OP) is one of the most interesting topics in supply chain - in part because it is on a path to supersede the supply chain. There is no question that many companies have become very, very good at the process; many have been at it for some two decades. I once heard a senior Dell official say that "S&OP is a religion" at the company, and that was about 10 years ago, if I remember correctly. For now, supply chain will still be the focal point for most of the thought leadership on S&OP. You can find only little on S&OP in financial circles, and almost nothing in sales and marketing channels.. Yet...given the number of conferences, books, articles, consultants, etc., that continue to address S&OP, it seems to me there must still be a quite a few companies that are very new to the process, or at least feel they have a lot of room for improvement. Some it appears haven't even started, despite the overwhelming evidence of the benefits - one might actually say the necessity - of S&OP. But even companies that would rate themselves very high in maturity always seem to be looking for new ideas from whatever source they can find that will further improve their own efforts. As with most things in supply chain, the definition of excellence in S&OP naturally continues to evolve. Those thoughts come with the latest release of our Supply Chain Digest Letter, focused this time in S&OP. That's a 16-page report we put together focused specifically on one topic, this time Sales and Operations Planning. Many of you will have received a hard copy in the mail. If you didn't, you can find one here: SCDigest Letter on S&OP 2011. Even better, as always you can visit our Full S&OP Information Center, which has the Letter plus video, white papers, cases studies and more. One of the interesting S&OP trends is a battle of nomenclature, but there is some deeper meaning behind that terminology skirmish. For some time but now gaining steam recently, many are pushing the term "Integrated Business Planning" or IBP as the correct name and concept for the process. We go into more detail in the Letter, but I think the basic idea can be summed up like this: S&OP really has its roots in supply chain, and tends to have a great deal of its focus on the important exercise of balancing supply and demand plans. IBP, on the other hand, is really about creating alignment to meet the company's financial goals. Supply-demand balancing is a necessary but not sufficient component of that goal. What is critical - and often left out of "traditional" S&OP - is aligning the supply and demand plans more tightly with the company's financial plan and goals. Gartner calls IBP a "more highly evolved form" of S&OP. Fred Baumann of JDA Software notes that "You could have a perfectly balanced unit-based supply-demand plan and totally fail to meet shareholder expectations." In the end, by whatever name you call it, it means S&OP/IBP is simply that way you manage the business, not just supply and demand. 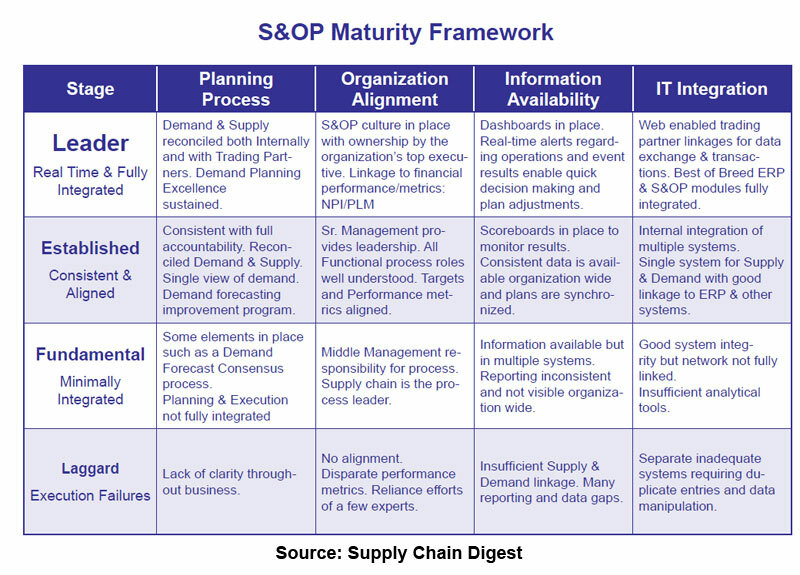 That idea can be clearly seen in the S&OP maturity model below. There is probably no area of supply chain that has seen more maturity models than S&OP, but two years ago when we did our report on integrated planning and execution, we couldn't help ourselves. The model below was developed in partnership with Bob Nardone, former supply chain executive at Unilever who led the effort there to get really good at S&OP. As can be seen, as a company reaches a higher level of maturity, the process becomes more core to overall business and financial planning, and much less focused on supply and demand per se. It is led by senior company executives, not the supply chain. I personally believe the term S&OP will largely stick. But while supply chain side of the house continues to the driver in getting S&OP off the ground in an organization most of the time, the evolution to the IBP process if not name means supply chain's role will inevitably diminishes, to an extent. The natural "lead" for IBP, it seems to me, is finance, and in a small but growing number of firms the CFO does "own" the process. But for now, supply chain will still be the focal point for most of the thought leadership on S&OP. You can find only little on S&OP in financial circles, and almost nothing in sales and marketing channels. • We continue to see a more explicit focus on inventory planning as part of the process in many companies, or what some call Sales, Inventory and Operations Planning (SIOP). That practice is important, and a big change in process, but I don't think the term SIOP will really last. Inventory planning will just be part of S&OP. • S&OP has some parallels to Lean, in that some "purists" have argued that S&OP was really about the processes, and that too much technology support just gets in the way of that. I think it is clear that is changing, as the complexity of the business environment, the need to understand the impact of decisions in one area on everything else, and the need to manage risk and the compare results of different scenarios means leaders understand a rich technology platform to support S&OP is really a necessity. This is actually quite a change from even five years ago, where spreadsheets were often viewed as good enough. • For consumer goods manufacturers and retailers, there is a growing focus on connecting the Collaborative Planning, Forecasting and Replenishment (CPFR) process with S&OP - something which somewhat inexplicably few had been doing until recently. The story of how Lowe's and Whirlpool have not only done this but turned it into a truly joint S&OP process between the two companies is a truly powerful one that will be detailed here before long. It's the model for the future. S&OP versus IBP - does the name matter? Is there an important difference in the concept, regardless of the name? What do you see as the key S&OP trends? Let us know your thoughts at the Feedback button below.